There are clear benefits to reading informational, non-fiction books with your children. Yet, I find that I have to force myself into that part of the library. I naturally gravitate toward the "new" fiction children's book section looking for well illustrated books and great stories for read to my children before bed. It is usually my children that ask me to help them find books on animals, diggers and dumpers, or even biographies on famous Americans. I found an article on Scholastic's website that highlights six benefits of reading informational text with younger children. The research has proven that reading informational text can provide the key to success in later schooling, prepare children for real-life reading, appeal to readers' preferences, address children's questions and interests, build knowledge of world, and boost vocabulary. 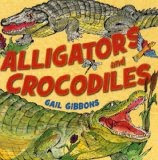 Gail Gibbons has been described as the "master of picture book non-fiction" by American Library Association Booklist. She has written and illustrated over 140 books for children on a wide variety of topics. She feels her success has stemmed from her "bright and visually exciting illustrations", a style that developed from her days creating art for NBC children's programming in the 1970s. She also feels that she doesn't "dumb down" the topics to her readers because a child can always ask an adult to explain further if there is confusion. Her books take months and months of research and sometimes up to 15 revisions to complete. She compares the challenging process of developing a 32-page children's non-fiction picture book to putting together a puzzle, "it's like watching pieces of puzzle finally fitting - bit by bit the book takes form." Fitting the pieces together in a way that is appealing and understandable for children has brought her numerous awards including the Children's Book Guild award for contribution to non-fiction in 1987 and more recently in 2010 the Regina Medal and the Oppenheim Toy Portfolio Best Book Award for Alligators and Crocodiles . 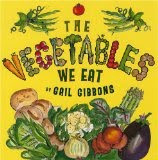 The wide variety of books by Gail Gibbons allows you to find a topic that interests each of the children in your family or students in your classroom. This week my family checked out Snakes , Penguins, Soaring with the Wind: The Bald Eagle, Owls , The Berry Book, and The Vegetables We Eat. I asked my daughter to pick one book to examine further with me. She picked The Vegetables We Eat which came as no surprise since we have been working on our first garden this summer. My plan for the two of us was to read the book together and while reading the book I was going to ask her to do a few tasks. I based the tasks on Bloom's Taxonomy, a favorite teaching tool that I used quite often to get my student's to achieve higher levels of thinking when I was a teacher. 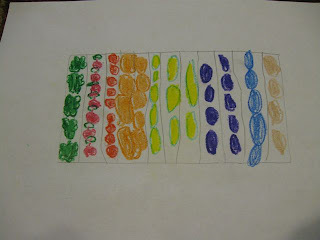 There are six levels of the taxonomy; remember, understand, apply, analyze, evaluate, and create. I found a great chart that gives verbs for each level that can help create activities that push thinking to a higher level. 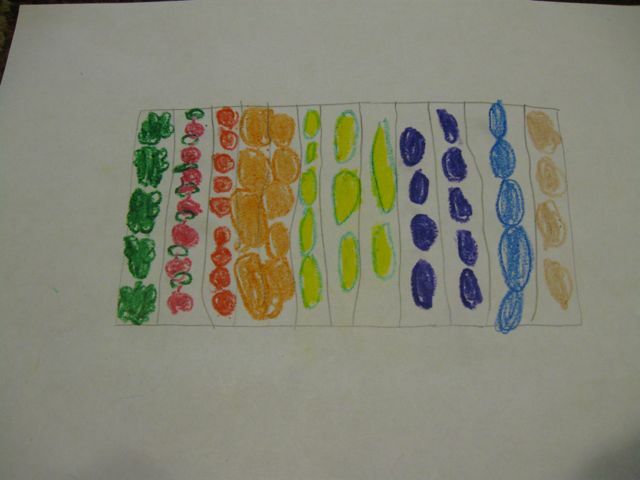 Naturally we ask children to tell or explain a topic, but this type of activity falls near the bottom of Bloom's Taxonomy. Verbs like construct, invent, and imagine allow children to think more deeply. 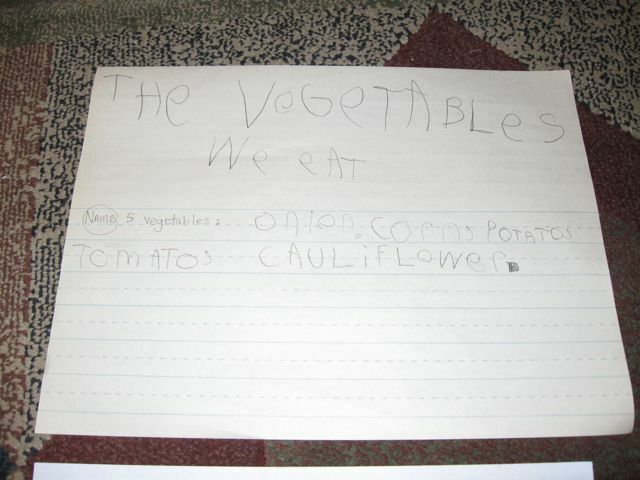 The first task we did was to make a "LIST" of vegetables (Bloom's lowest level of thinking, Remember). The second task was to "DISCUSS"(Understand Level) the difference between annuals and perrenials which was clearly explained by Gibbons in the book. 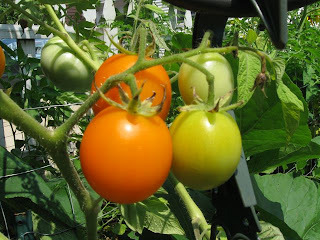 The third task was to "EXAMINE" (Apply Level) our garden by taking pictures. 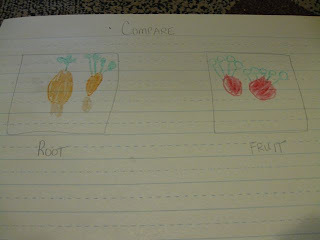 The fourth task was to "COMPARE" and "CONTRAST" (Analyze Level) two vegetables that she drew. The fifth and final involved the two highest levels of Bloom's Taxonomy, Evaluate and Create, when my daughter had to "PLAN" her own garden by "DECIDING" and "PRIORITIZING" which vegetables she would plant. I have realized that reading non-fiction books with my children is extremely important. I am now trying to strike more of a balance in the books that I select to bring home for them. Gail Gibbons will always be an author I can look for to add to my stack of non-fiction books! Great ideas! Your children are truly lucky to have a Dad that is so involved! My oldest child loves Mary Pope Osbornes Magic Tree House Research Guides. They are non-fiction books that correlate with her fictional stories.